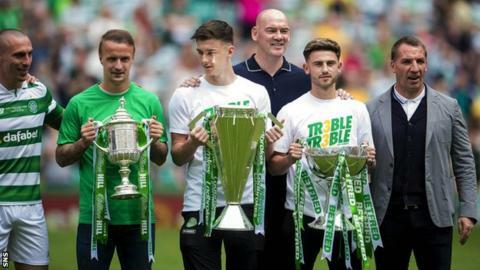 Celtic have what it takes to emulate Martin O'Neill's class of 2003 and reach a European final, says former midfielder Stiliyan Petrov. However, the Bulgarian has urged fans and the media to give manager Brendan Rodgers time to build a capable side. "If they progress the way they are progressing, maybe one day," said Petrov. "But, if he (Rodgers) wants to achieve a European final I think he needs to add on (players). He knows that. " Petrov, 37, was back at Celtic Park with a host of former stars to play in a charity match a day after Rodgers' side clinched an unbeaten domestic treble with a 2-1 win over Aberdeen in the Scottish Cup final. The ex-CSKA Sofia and Aston Villa midfielder was part of the last Celtic team to complete a domestic clean sweep in 2000-01 and played in the Uefa Cup final against Porto two years later, losing 3-2 to Jose Mourinho's side in extra time. Celtic's previous European finals came in 1967 and 1970. This season, Celtic finished bottom of a Champions League section topped by Barcelona and Manchester City, failing to win a group match. Petrov is sure Celtic can improve under Rodgers and pointed to this season's beaten Europa League finalists Ajax as an example of a side who have been given time to develop. "Going a season unbeaten, it's incredible," he said. "It doesn't matter if it's England, Scotland, France or Spain. It will go down in history. "I think we're judging this team too early. Don't forget it is Brendan's first season. "Ajax have been patient, they haven't put pressure on their players. We're putting pressure already on Brendan Rodgers to get to a European final. If he can achieve it straight away it would be amazing." Henrik Larsson led one of the Celtic teams in front of 60,000 fans, his "Henrik heroes" defeating Lubo Moravcik's "Lubo's legends" 5-2, with Larsson bagging a hat-trick. The Swede believes it is unfair to compare the current team with O'Neill's treble winners. "Going a full season without getting beat is fantastic," said Larsson, 45. "I haven't seen enough to know how good they are. But they've got potential. The future will tell how great they are going to be. "It's not fair to compare different eras. It's hard to compare different teams, I don't think you should do it. It's not right because football is constantly developing. "It's a good side, but we also had a very good side."